Who will dare say out loud ‘the emperor has no clothes’? In a normal democracy, urgent questions are asked when the prime minister says things that are wildly untrue. Was he lying or deluded? Which of these possibilities is more alarming? If he was lying, had he never heard of Google? If he genuinely didn’t know what the Government has been up to, why is he in government? 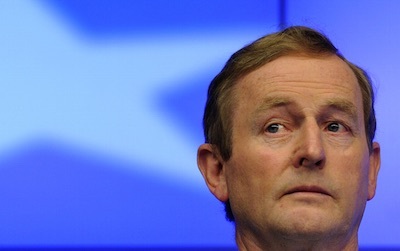 But we don’t bother to ask these questions about St Enda’s extraordinary epistle to the Athenians last week, when he urged Greece to follow Ireland : “in Ireland’s case we did not increase income tax; we did not increase VAT; we did not increase PRSI”. Each of these claims is flatly wrong: all three taxes were very substantially increased, both by the present and previous governments. But this truth is utterly irrelevant. Why? Because we all know that the Taoiseach wasn’t making a statement about reality. He was telling a story. At some point in our lives - usually when we’re three or four - we all ask the question: “Daddy, did this really happen or is it a makey-up story?” And once we know which is which, we’re okay with it. And by now, we’re more or less okay with the fact that Ireland’s primary presence on the European stage is as a makey-up story. We don’t live in a country; we live in a narrative, a tale with no more truth content than Cinderella and considerably less than “The Emperor’s New Clothes”. Our current story is called, according to the Minister for Foreign Affairs Charlie Flanagan, “the pride of Europe”. Of course this doesn’t mean that Europe is proud that we’ve almost doubled consistent child poverty, or that we keep centenarians for days on hospital trollies or that basic services like clinics for sufferers of rheumatic diseases are simply disappearing or that we’ve been left with unpayable public debt. It surely doesn’t mean that Europe is proud that little Ireland was forced to bear the cost of a bank bailout put last week by Patrick Honohan, governor of the Central Bank, at [euro]100 billion and rising. At the level of reality, it doesn’t actually mean anything at all. But that doesn’t mean that it’s a harmless fiction. “The Pride of Europe” is a makey-up story that is intended to take the place of the realities it displaces. It’s not a stand-alone narrative. It has an evil twin: Greece. It belongs to a particular genre of fiction: the morality tale. Ireland is the pride of Europe because it is the anti-Greece. We are good because we play along with the bigger stories of the euro zone crisis. Greece is evil because it stopped doing so. One of those stories is that the crisis had nothing to do with reckless lending (by, for example, German state banks) and was created purely by reckless borrowing. The other, even more fantastical, is that so-called austerity (in reality a programme of sucking citizens dry to transfer their resources to private banks) produces economic growth. These stories are as patently false as Enda’s fairy tale, but Ireland is the pride of Europe because it has gone along with them and Greece is the shame of Europe because it has not been able to sustain the suspension of disbelief. Greece’s membership of the euro zone was always a fiction - a story that everyone agreed to believe because it was more convenient than reality. Greece never met the fiscal criteria for membership. So how was it allowed in? By cooking the books. A right-wing Greek government worked with Goldman Sachs to hide its debts using massive currency swaps at fictional exchange rates. Euro zone governments went along with the story. When the crisis hit in 2008, there might have been a moment of truth. Instead we had the classic dynamic of a lie spawning more lies. The banks that lent so recklessly were bailed out by transferring their debts to European taxpayers and the IMF - their culpability disappeared from the story. A new fiction was invented - that Greece could simultaneously have its economy shrunk by relentless austerity and pay back hundreds of billions of euro. The startling thing about the current debacle is that no one really believes this story any more. The IMF has long since admitted that its calculations about the economic effects of austerity were wildly wrong. No objective analyst believes that Greece can pay back its debts. And yet the story must be maintained: Greece must keep punishing its people to pay back the money being borrowed to make the payments on the unpayable loans. In the upside-down world we inhabit, Syriza, which has called a halt to this fiction, is a bunch of mad fantasists, while the troika that goes on acting as if the fictions were real is the voice of hard-headed realism. Everything - from the lives of ordinary Greeks to the foundations of the European Union - must be sacrificed to the story. “The Pride of Europe” is Ireland’s special contribution to this toxic fantasy. We exist, not as a society, but as a necessary validation for a destructive fiction. Just as well that the Pride of Europe knows no shame.